Why choose a MEGA Sports Camp outreach? Sign up at MEGASportsCamp.com to get helpful planning checklist reminders, updates, and special offers for your MEGA Sports Camp outreach. When kids face difficult opponents, adversity, getting tired, and high pressure situations, good FUNdamentals lead to victory. The same is true in our faith journey. Just like Nehemiah and the Israelites who rebuilt the wall of Jerusalem, faith FUNdamentals based on timeless biblical truths lead to success too. Scripture taken from the New King James Version®. Copyright © 1982 by Thomas Nelson, Inc.Used by permission. All rights reserved. Baseball and Flag Football Playbooks available separately. See p. 11. • Sports Basics (Preschool) • Cheerleading Playbook • Basketball Playbook You need to order the Cheer Training DVD and CD-ROM and the Cheer Music CD (p. 10) for your Cheerleading Coach. W H AT D O Y O U N E E D T O W O R K H A R D AT ? W H AT I S Y O U R S P O R T S G O A L ? H OW C A N Y O U B E UNSTOPPABLE? WHAT IS YOUR SPORTS GOAL? 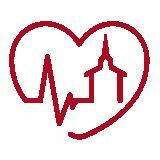 Think about athletic people in your church or community. Offer sports these people would like to lead. It’s a great chance to get new people involved, like college students and parents. You’ll need a gym, grassy area, or parking lot. If you have none of those, opt to use facilities at a park or school. Almost every format you can dream up, MEGA Sports Camp curriculum can fit. If the 5-day, 3-hour schedule shown below doesn’t work for you, spread it out for 10 weeknights or Saturdays. The Director Guide gives job descriptions for every volunteer. Coaches focus on just one part— sports, music, Bible lessons, small groups, or snacks. Training your volunteers is a snap. See MEGASportsCamp.com/Leader-Resources for schedule options. See p. 11 for sports playbooks. MEGA Sports Camp FUNdamentals Director Guide Complete directions for planning and running your camp. Includes scheduling, checklists, publicity, registration, how-tos on every segment of the camp, safety, recruiting, training, reproducible pages for your staff, and more. Check out the at-a-glance overview for an easy way to see what’s new. In Kit only. 8 x 10¾", 120 pages. NEW! MEGA Sports Camp FUNdamentals Flash Drive Filled with music action videos, art, promotions, Rally time PowerPoint® presentations with videos, and more! Plus all the files to build your own presentations! In kit only. 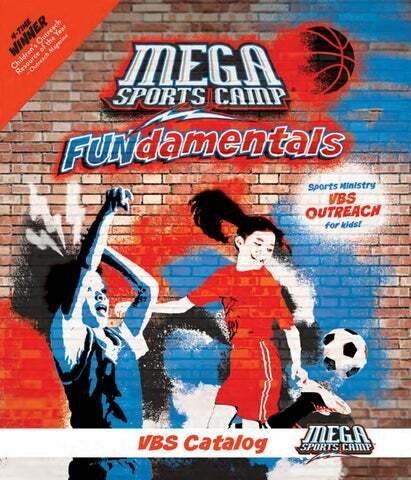 MEGA Sports Camp FUNdamentals Media DVD For those needing Rally videos, music actions, training, and promos in DVD format. In kit only. All prices listed in U.S. dollars. No returns on opened electronic media unless defective. MEGA Sports Camp FUNdamentals Coach Huddle Guide Small Group Time Helps Huddle Coaches (small group leaders) lead their group time. Includes tips on building a relationship with kids, leading a child to Christ, and helping them memorize the MEGA Verse. Paper, 4½ x 8½", 32 pages. Evangelism Keepers Full-color images help you tell God’s plan for eternal life during Rally Time. Back side shares simple statements, Bible verse references, and prayer. Get enough for each Huddle Coach and child. Pack of 5. MEGA Sports Camp Coach T-Shirt When all adult volunteers are wearing the same MEGA Sports Camp Coach T-Shirt, it’s easy for kids and other leaders to quickly recognize who’s in charge. Polyester/cotton blend. Life and Ministry Skills Accommodate kids who are unable or less inclined to play sports by adding these Life and Ministry Skills. You’ll need all three to equal the same sports time. Spiral. 5½ x 8¼"
MEGA Sports Camp Cheer Training DVD and CD-ROM This DVD shows the moves, stunts, chants, and cheers that go with the Cheerleading Playbook. Use it for simple, no-hassle sessionsâ&#x20AC;&#x201D;the DVD is the coach! The CD-ROM includes printable step-by-step actions. New cheers available. See below. MEGA Sports Camp Cheer Music CD Pump up the energy with songs for routines, chants, and cheers. Features songs from the Cheer Training DVD, so kids can learn the motions to the same routines they will perform. Your final MEGA Sports Camp performance will rouse the whole crowd! MEGA Sports Camp offers a mix of sports and other activities. Here’s a sample schedule for one day. Do not form teams. Give each kid a pinny and have him tuck it into the back of his shorts to make a “tail” that is long enough to swing back and forth. Set boundaries with cones in relationship to the size of your group. Give each kid a ball. Explain the game: 1. Each player dribbles and tries to protect his tail while trying to pull out the tails of other players. 2. A player may not hold his tail to protect it. When a player pulls out a tail, he throws it to the ground. The player who has lost his tail must kneel where the tail landed until the game ends. He may steal tails from other players who come within reach of his kneeling spot. He may not leave his knees. 3. The last person with a tail wins. VARIATIONS: Play the game with designated tail colors. Allow the girls to play against the boys. INTRODUCTION: Emphasize three key points about dribbling: 1. Players must change speeds. 2. They must change direction. 3. They must keep their heads up as they dribble. This is crucial to creative play. Use any of the following drills during the technical session. They should be mixed in and around your instructional time on dribbling. Choose the ones that best fit your group and plan. For today’s drills you will need pinnies, cones, and soccer balls. MEGA Sports Camp Playbooks Outlines a complete schedule of drills and fundamentals for each Sports Session, with step-by-step instructions and illustrations. Soccer, Basketball, and Cheerleading Playbooks are included in Kit (see pgs. 4­­–5). Order extras as needed for every Head Coach. We suggest you have one Head Coach for every 16 kids. Spiral. 5½ x 8½" Basketball. 48 pgs. Soccer. 48 pgs. Cheerleading. 64 pgs. MEGA Sports Camp T-Shirt Quickly identify kids involved in your camp, especially when youâ&#x20AC;&#x2122;re outside or in public places. 100% cotton. Preshrunk jersey. Blue Always order more T-shirts than you think you can use. See T-shirt sizing chart on MEGASportsCamp.com. MEGA Sports Camp Iron-Ons Make your own MEGA Sports Camp T-shirts with these iron-ons! Iron-on is white only. Great as awards. Adheres best to cotton. 5½ x 4". Pack of 10. W H AT I S Y O U R S P O R T S G O A L ? W H AT S K I L L S H AV E Y O U WORKED ON? W H AT W I N C A N Y O U C E L E B R AT E ? Highly Recommended: just $2.60 per kid Enough for five kids included. Kids love these full-color, take-home newspapers. Every day features an exciting sports story and review activities. Extras include response page activities and more. Includes 5 take-home papers for each kid. Enough for 5 kids. Pack of 5. 5¼ x 8"
MEGA Sports Camp FUNdamentals Theme Keepers Send these fun and interactive collectibles home with kids each day (6 per kid). Shows daily MEGA Point on one side and MEGA Verse on back. Pack of 5. MEGA Verse Wristband Band has the MEGA Verse (1 Corinthians 16:13), WSFITFBBBS, and MEGA Sports Camp logo on it. The acronym helps kids memorize the MEGA Verse. Great as a conversation starter with their friends. Black silicone. 1" wide. Pack of 5. MEGA Sports Camp Gospel Ball Use these colorful squeeze balls to share about salvation and then send home with kids as awards or take-home prizes. Each color represents a part of the gospel message. Foam. Approx. 2¼" diameter. Item	UPC 33VS0169	851648003553	$1.59 *While supplies last. Now What? for Kids: Salvation Send these booklets home with kids who come to salvation during your outreach. Features answers to common questions kids have following salvation. Paper, 4 x 6", 32 pages. Item	ISBN 02VJ0567	978-1-60731-976-4	$1.29 10 or more $.99 ea. Sports Ministry VBS Outread for Kids!